Here in the Philippines, besides Christmas, another unique thing that happens on December 25 and that is the beginning of the Metro Manila Film Festival. I'm pretty much sure there are a lot of wonderful movies to watch this year's film festival but if you want to watch a wholesome, funny, and family oriented movie - MY LITTLE BOSSINGS is your best bet! 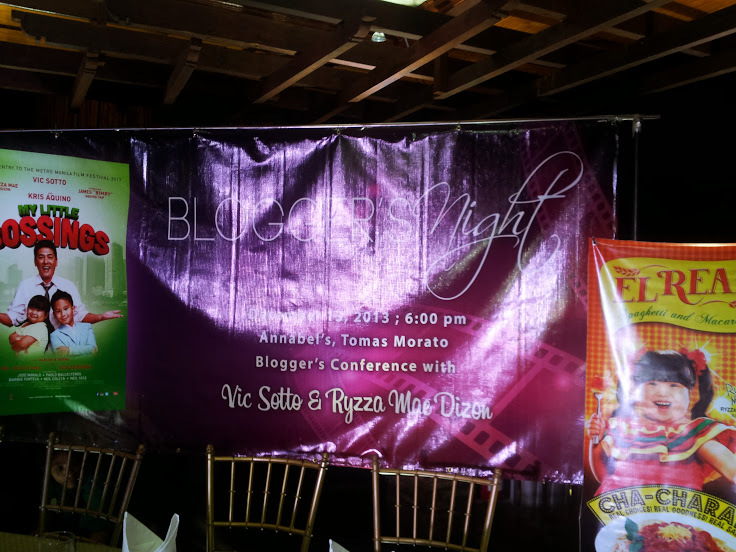 Just a few weeks ago, I was invited to the MY LITTLE BOSSINGS Blogger's Night - a bloggers' conference at Anabel's at Tomas Morato. 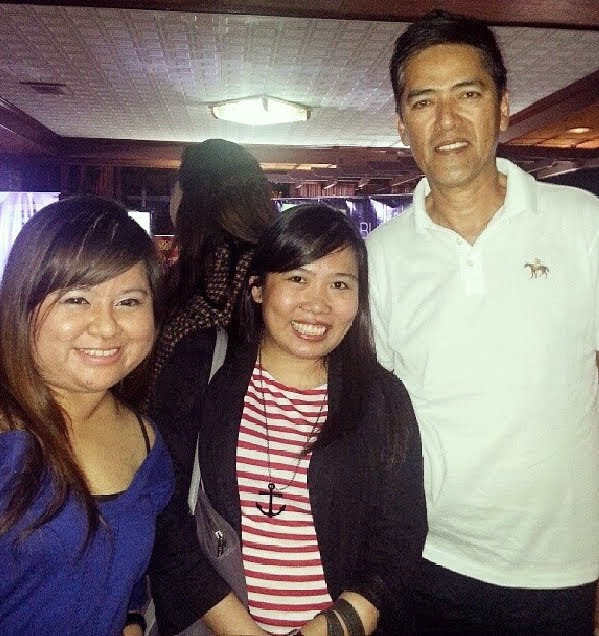 For the first time, I was able to see the Bossing Vic Sotto and the charming little bossing Ryzza Mae Dizon and hear them talk all about the movie My Little Bossings. Just to be able to see Boss Vic up close and personal had me a bit starstruck after all, I did grow up watching him everyday on Eat Bulaga ever since I was a kid! hehe. 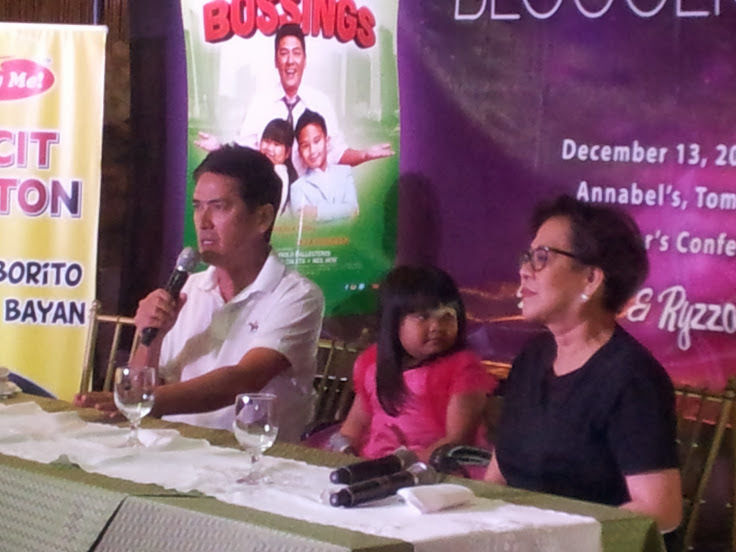 Miss Bibeth Orteza, the writer for My Little Bossings, was also there to share how this movie came about. I really enjoyed this "press conference" with the bloggers because indeed Boss Vic made it easy for us. Without a lot of prodding, he shared his heart out on how and why the film came to be, how fun and also challenging it was filming it especially with the two child stars Ryzza and Bimby, and why this is the must watch MMFF movie this year. In fact he proudly said that this was one of his best movies so far. Wow that's surprising especially after all the hi-tech fantasy movies he has done so far (Enteng Kabisote). I guess maybe because the movie is all heart - nakakataba ng puso so to speak! “My Little Bossings” is a movie whose time has come. Ever since the project was bared, the public has been counting months, waiting with bated breath how the precocious Ryzza Mae Dizon will jive with the decorous James “Bimby” Aquino Yap, Both charming and intelligent, but one street smart and the other “socially elite,” it’s an intriguing pairing indeed. How did this movie came about? According to Boss Vic, he decided he wanted a change from the challenging fantasy scene (he went on to assure that Enteng Kabisote wasn't retiring.. just taking a break) and decided to pursue this project that he wanted to have with the child stars Ryzza Mae and Bimby. 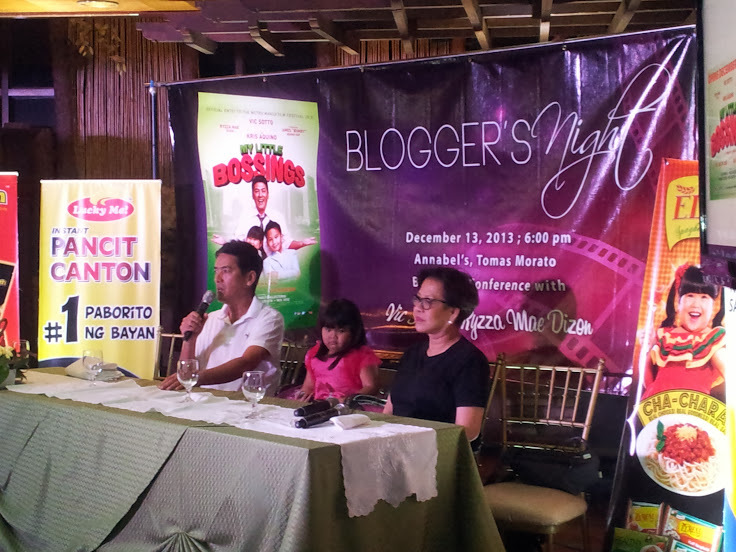 He recalled a talk he had with Kris Aquino about Bimby collaborating for a movie. After a call, the rest is history! With the help of Miss Bibeth Orteza, the story materialized. Yes, the movie was made with the two child stars in mind so it wasn't that hard or challenging for the kids. How were the child stars able to cope with each other and the shooting of the film? According to Boss Vic, working with the child stars was fun and easy. He definitely knew how to deal with them, and that's by playing with them! Acting and interacting with them on and off screen was easier because he established good rapport with them through joking, teasing, and playing with them. According to Ryzza, one of their favorite games to play (probably during breaks) was bato-bato-pick! Both Boss Vic and Ryzza shared that at first Bimby was a bit stiff because of course they just got to meet with him but after a while they all were good friends. Harutan or wrestling with Bimby was how Boss Vic bonded with him. Acting was natural because of the incredible script as well. With this kind of atmosphere during the filming, I can definitely see the movie becoming a hit! Sabi nga ni Boss Vic, we need something to lift our spirits or humor up. And this movie seems to do the trick. Laughter is said to be the best medicine. And this film is up to the challenge to bring delight and laughter to us all. And it looks like My Little Bossings has indeed stolen the hearts of many of us because My Little Bossings is currently on the NO. 1 spot according to the official twitter page of Metro Manila Film Festival! Yup, this really makes me want to go to the movies and watch it. :) So my dear coffeeholics, if this hasn't convinced you yet to watch My Little Bossings, well then watch this trailer to learn more about the storyline. My Little Bossings -- Vic plays the role Torky Villanueva who works as a bookeeper for the millionaire cash management specialist Baba Atienza (Kris). Because of some conflict in her business, Baba entrusts her son Justin (Bimby) to Torky’s care for fear of her life. In the meantime, Torky’s niece Ice (Aiza) who lives in the same house with him, is involved in an advocacy for street children where street kid Ching (Ryzza ) becomes her special ward. Ice brings Ching home when the orphanage closed down. The fun begins when all these people start living in one roof while they each tackle his respective personal dilemma. So coffeeholics if you haven't watched it yet.. well go watch My Little Bossings - a fun filled family oriented movie for this year's Metro Manila Film Festival. Let me know what you think of the movie!